If you're not on page 1 of Google, you're losing $$$ every day - and if you don't know what you're doing, your SEO efforts may get you blacklisted by Google, making you completely invisible! Why go through all that hard work just to get a huge kick in the face? For $20; receive 30+ high quality backlinks from trusted domains. Help give your website a boost in search and authority. Check my gig extras for add-ons! 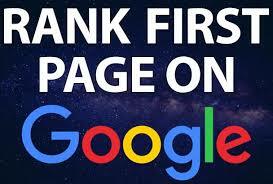 Ranking First Page on Google takes time - but you can achieve it! Check out my FAQ, slides, and gig extras for more information! Order today for professional, optimization that pushes your website higher - or contact me today and claim your free consultation! I Will Rank Your Website First Page Of Google is ranked 5 out of 5. Based on 3 user reviews.